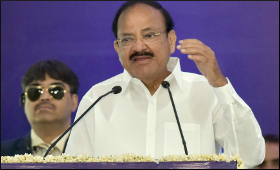 During Vice President Venkaiah Naidu's three-nation tour to Serbia, Malta and Romania, the leaders of these countries expressed admiration for India's economic growth, said an official release on Friday. The leaders in all the countries expressed unequivocal admiration for India's economic growth and were eager to engage and partner with India politically, economically and culturally, said a release. In Romania, there was a special interest in Space and Aerospace. Malta expressed its desire to join the International Solar Alliance, it added. The visit gave an opportunity for the members of India Diaspora to listen to the Vice President about the transformative agenda of the government and encouraged them to think of various ways in which they can contribute to the country’s development, it said. The vice president underscored the growing importance of India on the world stage and drew attention to four key features that need to be recognized. He called them 4Ds – Democracy, Demographic dividend, Demand and Diaspora. The visit evoked a lot of interest among the top political leadership and there was an air of bonhomie in all the meetings, it added. During the visit, several MOUs entered into related to plant protection, tourism, air services, oil research, diplomatic training and maritime cooperation.